Italian winery owner Guilio Bertrand was inspired by the actress of his homeland in naming restaurant Sophia’s at Morgenster, which opens in November. I had a sneak preview yesterday and found it to be a relaxing, tranquil lunch option if you’re in the vicinity of Somerset West. White linen tables and wooden beams set the tone inside, with modern white square tables and Italian red chairs offering terrace views of olive groves and vineyards. Craig Cormack and Bertus Basson of All Things Culinary are behind the edible side of the project. Basson remains hands-on at Overture Restaurant, so Sophia’s is where Cormack’s cooking shines. The restaurant has an old country feel with modern touches, and Cormack’s food functions along similar lines. Tasty dishes without pretence, using produce including lemons, loquats and herbs raided from the estate’s trees and herb garden. Where Overture is cheffy food, these are honest plates with a master hand directing them. In other words, good to look at, with no foams or tiny portions in evidence. It goes without saying that tasting menus won’t be a standard feature. 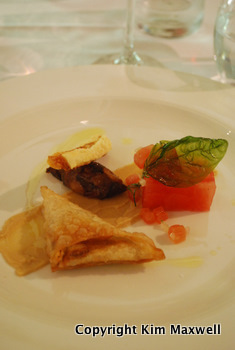 I enjoyed a Med dish made for summer, featuring a beautiful terrine: a rectangle of peeled tomato segments with an aubergine samoosa and a Middle Eastern spicy raisin relish on a smear of humus. Why has it taken so long for a chef to concoct this delightful warm aubergine and fried pastry combination? The recommended wine on the menu: Morgenster Italian Collection Caruso 2010, a refreshing, dry Rosé. Slow-braised lamb loin with mash and baby carrots was meltingly tender and delicious, especially with its recommended wine, the classy Morgenster 2006. It’s a wine made for food, but so complete in a glass that you’ll happily sip it solo too. 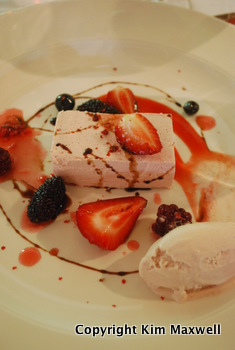 And I loved Cormack’s modern take on strawberry mousse with light, creamy strawberry ice-cream and seasonal berries. The menu could also feature Italian pasta or classics such as beef Wellington, sole with a traditional sauce or avo Ritz made with sauce Chouron (tomato bearnaise) and gremolata prawns with a Cormack twist. An uncomplicated local wine list has Morgenster labels dominating. 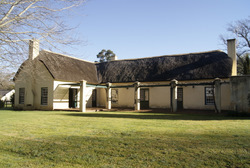 Pricing: Pay R155 for two courses or R220 for three. FlavourTip: Experience Cormack’s innovative Morgenster wine and salt tasting with selected salted foods in the winery tasting room.